Welcome to Moose Hollow MH1406! Tucked away in the gorgeous Wasatch Mountains, this unique four-bedroom condo is the perfect place to relax, ski Utah's champagne powder snow, or enjoy the sunset from Pineview Resevior. With open living spaces and four large private bedrooms, there is plenty of room for friends and family to enjoy each other's company. Convienently located at the base of Powder Mountain road, you are just minutes from some of the best skiing, mountain biking, and hiking Utah has to offer. If you prefer taking it easy, you can relax on the beach at Pineview Resevior or enjoy a book on the private balcony, whatever you want from your vacation, MH1406 will deliver! Main Level: Kitchen, living room with TV, half bathroom, balcony, and laundry. Upstairs: Four bedrooms with two Jack n' Jill bathrooms with walk-in showers. Bedroom 1: 1 King bedroom with shared Jack n' Jill bathroom. Bedroom 2: 1 Queen bedroom with shared Jack n' Jill bathroom. Bedroom 3: 1 Queen bedroom with shared Jack n' Jill bathroom. Bedroom 4: 1 Queen bedroom with shared Jack n' Jill bathroom. 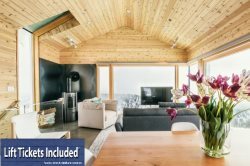 We are truly excited and honored to share our homes with each and every guest and we invite you to stay with us at Powder Mountain Getaways - MH1406!